Shoppers looking for some fresh ideas are being encouraged to check out Paisley Farmers Market when it moves to a new location and time this weekend. The popular twice-monthly market has been a fixture in County Square over the past 12 years. But it is now moving along the street to Paisley Cross as part of a revamp which will see midweek markets introduced for the first time. Markets will take place on the second Thursday and last Saturday of every month, at a new time of 10am to 2pm, slightly later than the previous time of 9am to 1pm. The first market at the new location will be this Saturday, 31 August. To mark the occasion, the council is laying on children’s entertainment, including face-painting, stilt walkers and balloon modelling. 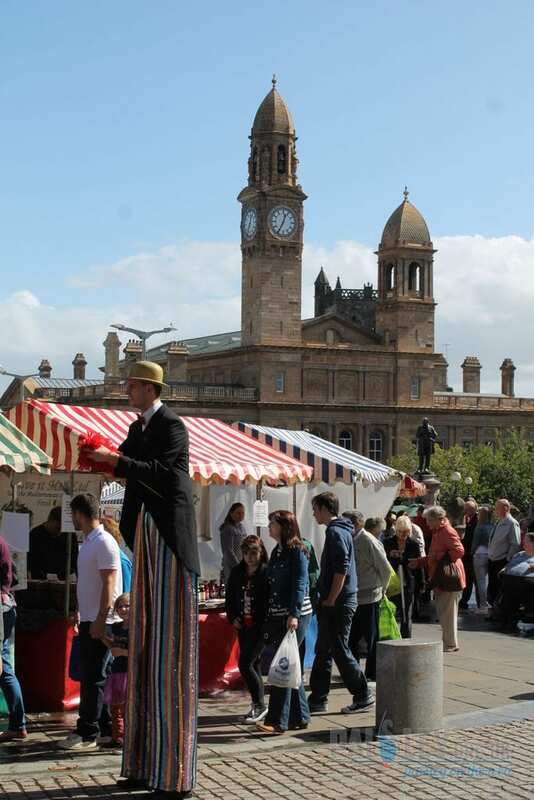 Paisley Farmers Market features a wide range of stall-holders offering quality fresh produce, straight from the farm to the shopping bag, such as meat,fish, cheese, fruit and veg, and chocolate. The market is operated by Ayrshire Farmers’ Market and Renfrewshire Council, and the decision to relocate came after consultation with traders and shoppers. Renfrewshire Council Leader Mark Macmillan said: “Town centre regeneration is a big priority for us. “We hope the new location will improve the visibility of the market and will in turn bring new vibrancy to Paisley High Street. “The market offers something a little bit different, which complements the range of shops we have already have in the town. All photographs taken for www.paisley.org.uk by Tracey Clements you can keep up to date with Paisley Events by visiting our Facebook Page here.